Can you help Peko on a thrilling, sweet adventure in the world of Milky? 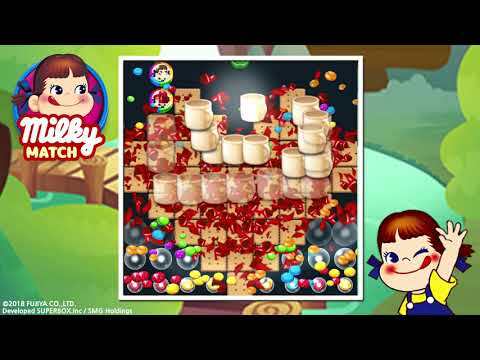 An addictive puzzle game that you can enjoy featuring your favorite Peko-chan! Match colorful blocks to blast them and create special items to destroy obstacles! Use your intuition and your brain to solve various puzzles, achie... see more Can you help Peko on a thrilling, sweet adventure in the world of Milky? - Featuring 1000 levels and constant updates to Milky Match. - Consists of different game variations and styles where you have to use your brain and skills to get to the next level! - Numerous boosters and powerful combos to blast any obstacles that is in the way. - Milky Match can be played offline! You do not need Wi-Fi or data to play the game! - Supports 16 languages and more to be added! Anyone can play Milky Match! This game supports &apos;한국어&apos;, &apos;Indonesian&apos;, &apos;Bahasa malay&apos;, &apos;English&apos;, &apos;日本語&apos;, &apos;中文简体&apos;, &apos;中文繁體&apos;, &apos;Deutsch&apos;, &apos;français&apos;, &apos;Español&apos;, &apos;ไทย&apos;, &apos;Русский&apos;, &apos;Arabic&apos;, &apos;Portuguese(Brazil)&apos;, &apos;Turkish&apos;, &apos;Italian&apos;.